theBoom Quiet: Bluetooth/ cabled headset with full stereo sound plus detachable, noise cancelling, microphone allows a quick transition from headset to headphone mode. theBoom Quiet also offers ANC (Active Noise Cancellation) in the speakers. Great for plane travel! Rechargeable battery. Unit also includes: theBoom Microphone, Micro USB Charging Cable, 3.5mm to 3.5mm Headset Adapter for cabled mode. NOTE: This unit will only work with landline phones with additional, theBoom Quiet 3 Landline Interface Adaptor and RJ9 adapters both sold separately. NOTE: At this time we do not offer a 2.5mm for cordless land line option. The world's best noise canceling microphone and Active Noise Cancellation (ANC) headphones for both ears in one package. Patented, award winning technology from theBoom and used both on Wall Street and by the Military. 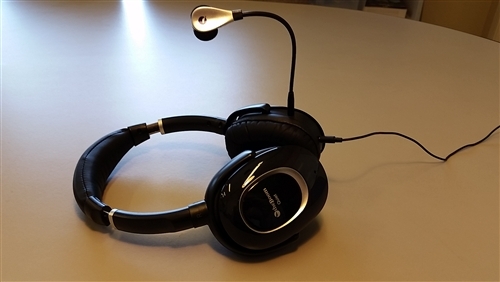 theBoom Quiet headset combines cutting edge noise reduction for the microphone as well as the speakers. Featuring UmeVoice's patented noise canceling technology for the microphone, theBoom Quiet enables users to be heard clearly regardless of the level of background noise. Using state of the art lightweight ANC (Active Noise Cancellation) technology for the speakers, theBoom Quiet helps protect the user's hearing from loud noises without the bulk of many ANC headsets. 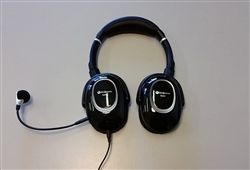 With our innovative design, theBoom Quiet converts easily between a highly effective noise cancelling communications headset for cell phones, computers, and PDA's to a high quality noise cancelling stereo headphones for the enjoyment of audio entertainment. theBoom Quiet headset combines the best of both worlds, cutting edge noise reduction for both the microphone and headphones. Patented UmeVoice microphone technology lets users be heard in any setting -- silent to extremely noisy. Superior lightweight ANC Electronics for speakers reduce the roar of a racetrack, or airplane engine. Specially designed noise reducing speaker domes with soft covering to fit firmly over ears for optimal seal. Detachable boom allows user to use device as stereo headphones or to simply reduce the cabin noise while travelling in an airplane. Boom adjusts easily to fit anyone. Includes cables for use with most cell phones, radios, and music players.